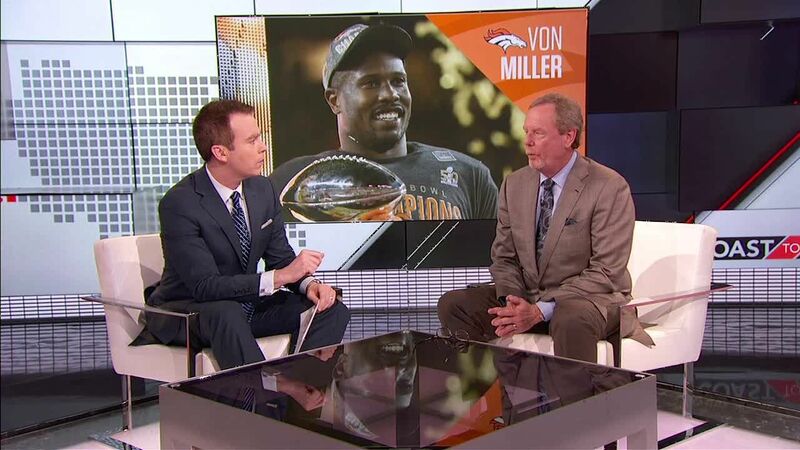 The Denver Broncos have scheduled a phone discussion Friday with pass-rusher Von Miller and agent Joby Branion, league sources told ESPN's Ed Werder. It is believed the Broncos recently modified their offer to Miller to earlier fully guarantee the third year of their proposed six-year, $114.5 million contract. The matter of how much, and how quickly, Miller would be paid guaranteed money in a new deal has been a sticking point between the sides. The deadline is July 15 for franchise-tagged players to sign multiyear contracts. Earlier this week, sources told ESPN's Adam Schefter thatBroncos general manager John Elway had personally called Miller over the Fourth of July weekend to express his desire to work out a long-term deal, after almost a full month without dialogue between the sides. Sources said Elway and Miller spent about 10-15 minutes on the phone during that call, with Elway telling Miller that the Broncos still love him and still want to re-sign him.Elway told Miller during that conversation that Denver would reach out to his agents this week in an effort to jump-start talks. Just last month, Miller publicly said he would not play this season under the franchise tag, and all contact between the sides had ceased. Some around the league thought there were hard feelings between the two sides, which could be why Elway personally reached out to Miller. Miller, the MVP of Super Bowl 50, received the Broncos' exclusive franchise tag on March 1. Unless Miller and Denver can reach agreement on a long-term deal by July 15, Miller will make the average of the top-five salaries of his position for this year. And because it's an exclusive tag, that will prohibit Miller from talking to any other teams. One of the league's best impact pass-rushers, Miller had 2.5 sacks and two forced fumbles as the Broncos beat the Carolina Panthers for the championship. He also had 2.5 sacks and an interception in the Broncos' win over the Patriots in the AFC Championship Game. Miller had 11 sacks, 35 tackles and four forced fumbles en route to his fourth Pro Bowl selection in 2015. He has 60 career regular-season sacks. Information from ESPN's Adam Schefter and Jeff Legwold was used in this report. ESPN NFL Insider Ed Werder says it's an encouraging sign that the Broncos slightly modified their offer to Von Miller and plan to speak with Miller and his representative about a long-term deal.